Apple might’ve found a cure to iPhone woes with its new extended battery case. With the new $99 Smart Battery Case, Apple is catering to smartphone customers who value practicality over slender designs. Unveiled Tuesday, the iPhone 6S Smart Battery Case is the company’s answer to the enduring problem of smartphones that run out of juice far too soon for frustrated smartphone users. Apple has finally decided to step into the extended battery case game. 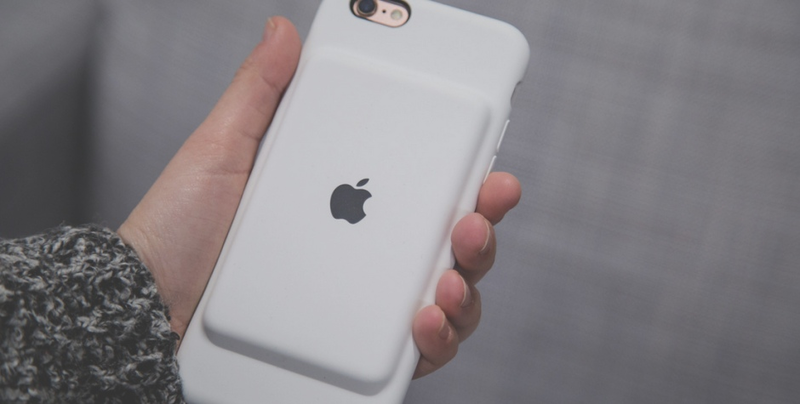 Third-party case manufacturers such as Mophie have long produced battery packs for the iPhone, but this is the first time Apple has gotten into the game. Apple claims its battery case is better than others because users will be able to swipe down in the notifications center to see the battery levels for the iPhone and Smart Battery rather than relying on a button on the case itself. When you plug in the case to charge, there’s also a battery indicator on the lock screen that tells you how much charge the iPhone battery and the external battery have. Unlike most battery cases on the market today, this one is charged via Apple’s standard Lightning cable. The case’s outside material compares similarly to the company’s previous line of silicone accessories, with an added hump sitting in the middle of the backside where the extra battery rests. iPhone 6S Smart Battery Case is the company’s answer to the enduring problem of smartphones that run out of juice far too soon for frustrated smartphone users. The case costs $99 in the US, £79 in the UK and AU$165 in Australia. Apple said the battery boost is enough to increase talk time to 25 hours, video playback to 20 hours and Internet use on modern high-speed 4G LTE networks to 18 hours. Apple has a plan to address short battery life to the relief of iPhone addicts everywhere. But the company’s new case, with a bumpy design and a hefty price tag to match, has received mixed reviews. The case is pricey and iPhone users know that the design of the iPhone is always changing and might not want to spend big bucks when they know they will be getting a new phone in the near future. Taking aim at the much-bemoaned batteries of slimmer smartphones, the Smart Battery Case for iPhone 6 and 6S aims to extend battery life to between 18 and 25 hours, according to the product description on Apple‘s website. But the case has also drawn its share of criticism. The bump on the back of the case is a total departure from Apple’s trademark clean, attractive design. And then there are rumors that Apple may release a new version of the flagship iPhone at an event in March. But meanwhile, iPhone users need to keep their devices fully charged. Organizations, companies and events buy and rent device charging kiosks from companies like Veloxity to cure phone battery woes for consumers nationwide.